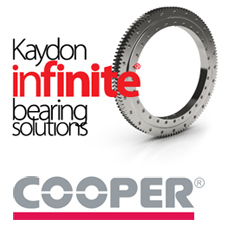 Cooper Roller Bearings, a unit of Kaydon Corporation, is reducing delivery times for its large, made-to-order split roller bearings, thanks to a significant investment in manufacturing capacity that allows it to handle all production steps in-house. Eliminating reliance on outside machining sources also gives the company more control over quality. The recent installation of new state-of-the-art machinery allows Cooper to perform all turning and grinding operations on its large made-to-order bearings and housings, even on split taper roller bearings for shafts up to 780 mm (30.7 inches) that previously required some machining by outside companies. Large cylindrical roller bearings and housings for shaft sizes up to 1,550 mm (5 feet) were already machined in-house. The $6.4 million investment by Cooper’s parent company, Kaydon Corporation, supports the growing popularity of Cooper’s large custom split bearings and housings, whose sales have been increasing by 25% annually. It further enhances the vertical integration of the Cooper operation in King’s Lynn, which includes design, casting, and finishing as well as turning and grinding. The split roller design of Cooper bearings makes them ideal for a wide range of applications, primarily where limited access for maintenance or replacement makes standard bearings impractical. They are also often specified in dusty, dirty or wet conditions, where dependable sealing is essential. Cooper Roller Bearings (http://www.cooperbearings.com) is a vertically integrated manufacturer of split-to-the-shaft roller bearings, producing all standard bearing sizes and housings with fast turnaround on large, custom-built units. Cooper invented the split roller bearing and continues to lead its development. Kaydon Corporation (www.kaydon.com) is a leading designer and manufacturer of custom-engineered, performance-critical products, supplying a broad and diverse group of alternative-energy, military, industrial, aerospace, medical and electronic equipment, and aftermarket customers.